She has come down in price by just under 50 per cent since she was originally listed with Simpson Marine almost four years ago to the day, in August 2011, for $8.5 million. She has now been sold for a final asking price of $4.5 million, or €3.86 million (XE Converter), making her the lowest priced 45m+ yacht to be sold so far in 2015. Matahari was built by the Italian yard in 1981 and has undergone significant refit work in her 34 years. She visited Rybovich in 1997 where she spent a year having superstructure and interior modifications. In 2006 she visited Melita Marine in Malta where she underwent a minor internal refit, engine maintenance and some external painting. The most recent was a refit in Bangkok in 2012, which included anti-fouling, reconditioning of the engine room and re-building of the aft section of the yacht. 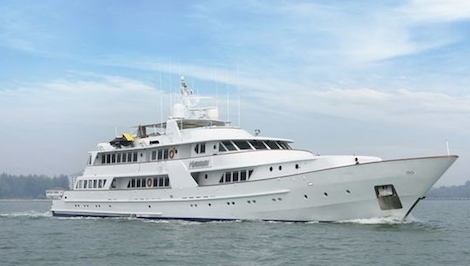 Matahari has enjoyed cruises in the Mediterranean, Hong Kong, the Maldives and Phuket, and with six trans-Atlantic passages to her name, she has proven that she is an economical passage-maker. On top of this, she can accommodate 14 guests over seven staterooms, highlighting the charter potential on offer for the new owner.